How to estimate the flooring cost? Installing a new floor in your home can be a substantial challenge - unless you're using our flooring calculator! Whether you're constructing your dream house and choosing floor finishes, or just replacing old and used panels in an apartment, you are bound to deal with the same problems - measuring the space and estimating the cost of flooring. And while the calculations are relatively simple, we know math is the last thing you want to do while you're renovating. We created this square foot calculator for flooring to take the maths off your plate. Thanks to this tool, you can quickly estimate the flooring cost and calculate how much hardwood, vinyl, or laminate flooring you need to install. With our help, any construction project is going to be a breeze! Already done with flooring? Check out our wallpaper calculator, too! Measure the room that you're going to install the floor in. We recommend measuring the length and width and rounding them up to the nearest inch. Make sure to always consider the widest point of the room, even if the walls are not perfectly straight. Multiply the width by the length of the room to obtain the square footage. If your room is not rectangular, but has a more irregular shape, you could try determining its area with our trapezoid calculator. Once you know the area of the room, you're good to go - this is the square footage of flooring materials you have to buy. If you want to cover the floor with square elements, the GCF calculator can be helpful if you are interested what the biggest possible size of a single tile is. If you're willing to put a bit more effort into the calculations, consider how much additional material to buy to account for waste during installation (for example to ensure that the patterns match on all pieces of flooring). We recommend adding 5-10% of the total area for that purpose. Once you know how much material you need, it's time to grab your wallet and drive to that Home Depot. Before you do it, though, you can spend a few more seconds to predict how much you're going to pay for the flooring. All you need to do is determine the price per one square foot of your chosen material, be it hardwood, vinyl, or laminate flooring. For example, your material of choice might be sold at 3 $/m2. Once you know this price, multiply it by the square footage of the material you need to buy to find out how much it will cost you. If the price is too high for your liking, make sure to consider other options - for example installing tiles or choosing a cheaper finish that you'll cover with a carpet. Naturally, this price doesn't take into account additional materials such as thresholds or special edging. If the type of flooring you chose is difficult to install, you might also have to include the cost of equipment (such as sanders or floor rollers) or even hire a contractor to help you. Are you still not sure how to use this flooring calculator? Let's consider an example calculation for laminate flooring. We want to install a new floor in your dining room. Measure the length and width of the room. Let's assume that its dimensions are 16' x 13'. Input these values into our flooring calculator. It will automatically determine the room area - in this case, it's equal to 208 square feet. If you want to consider the waste of the flooring material, open the advanced mode and enter a waste factor. We'll take a factor of 5% to account for the trimming. 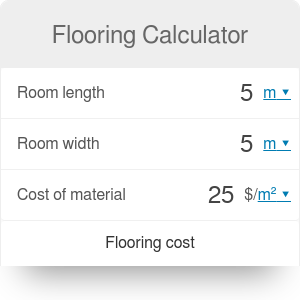 The flooring calculator will automatically add more material to the amount calculated in step 2. Instead of buying 208 square feet of the material, you will now need 218.4 square feet. Find out the cost of laminate flooring per square foot. Let's choose scratch-resistant laminate at $2.59 per sq. ft. Finally, estimate the flooring cost by multiplying this value by the amount of required material. Our calculator does it on its own, showing you the total price of $565.66. Flooring Calculator can be embedded on your website to enrich the content you wrote and make it easier for your visitors to understand your message.